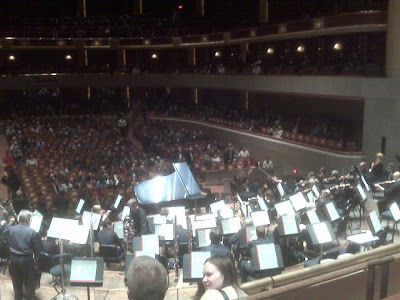 Brian and I went to the Dallas Symphony Orchestra last night. Selected Fridays during the season are called Casual Fridays. You are allowed to wear jeans. Here is a view of from our seats. Pictures were not allowed during the performance and this was with my camera phone. We sit where the budget allows. The Symphony preformed Prokofiev: Music from Romeo and Juliet and sounded great. Terrell defeated Mesquite Poteet last night 47-24, details of the Homecoming win are up at the Tribune.